The retiree can select a new home from a wide variety of available housing in th City of Laurel. Most houses are one- and two-story detached structures. During the past five years, a number of developers have opened new subdivisions at Peachtree Bend, Twin Oaks, Timber Ridge and Windermere, all of which have renewed interest in single-family dwellings. Three new developments will provide affordable housing for buyers interested in townhouse and apartment living. Laurel enjoys one of the lowest crime rates in the state with major felonies constituting less than 10% of all crimes committed in the city. 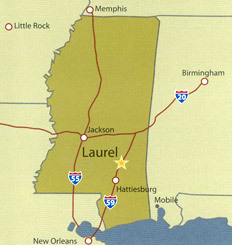 The Laurel Fire Department is rated Level 5 by the State of Mississippi. This highest designation lowers homeowners' insurance rates considerably. Located in the mid-latitudinal range of the United States, Laurel enjoys a milde "Four-Season" climate. Based on a 30-year record cycle, Laurel and Jones County enjoy a cumulative precipitation of 55-60 inches per year (an average of 4-5 inches per month) and average temperature highs of 76°F and lows of 52°F. Of course, every area has its extremes, Laurel included. Hottest months are July and August with an average high of 91°F; the coldest months, typically January and February with an average low of 34°F. Laurel's pleasant weather pattern creates a perfect climate for continuous outdoor activities and an avid gardening culture. South Central Regional Medical Center with 285 beds serves the medical needs of the Laurel area, along with two others in a 30-mile radius of the city. The medical profession is represented by 24 specialists with a total of 94 physicians on staff at SCRMC. Twelve family practitioners serve the area. SCRMC has won top honors and is an outstanding practitioner of community medicine at its best. Individual physicians are also noted in their fields of specialization. Examples include Dr. Vinay Kumar, a vascular surgeon, who was the first U.S. doctor to implant a revolutionary new stent and who has a nationwide clientele. A minimally invasive procedure to correct spinal callopse from osteoporosis is available in Laurel through orthopaedic surgeons. The list of "firsts" among local physicians goes on and on. Also available to residents are rehabilitation and wellness services, including, but not limited to physical therapy, occupational therapy, speech therapy, therapeutic massage, water aerobics, obesity programs, pediatric therapy and special exercise classes for the over 50 age group. In addition, the Cardiac Rehabilitation unit at SCRMC is state-of-the-art. The City of Laurel boasts more than 95 acres of parks for the enjoyment of the public. Three major parks — Mason Park, KC Bottoms and Sandy Gavin — provide basic amenities, including modern restroom facilities, covered pavilions with barbeque pits, playground equipment and lit walking tracks. For more information, visit www.laurelparksandrec.com. enacted each first weekend of December when the Sertoma Club of Laurel presents the largest Christmas parade in the State of Mississippi and Southeast region of the United States. And you will also want to purchase your tickets with hundreds of others to taste the maple syrup and warm butter of 'Pancake Day' with the Kiwanis Club after the parade! But don't forget to start your early Christmas gift shopping in downtown Laurel in the unique antique shops of Tiffany Emporium and Southern Antique Mall. Located in the heart of the Piney Woods in southeastern Mississippi, Laurel is a gracious southern town of approximately 21,000 residents that offers sophisticated choices du to proximity to some of the most exciting ities in the world. Residents can visit New Orleans, a two-hour drive; Atlanta and Memphis, six-hour drives; and the Mississippi Gulf Coast, a one-hour drive, all by interstate. Northwest Commuter Service at Pine Belt Regional Airport provides residents worldwide access by air, while AMTRAK's twice daily "Crescent" connects Laurel to New Orleans and with the cities along the eastern seaboard to New York City.